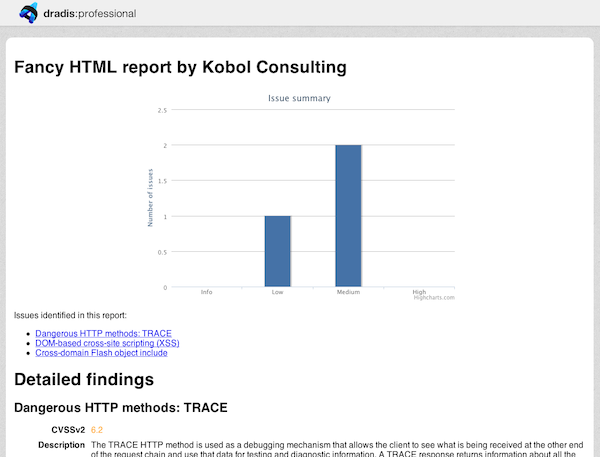 In this guide we're going to cover some of the possibilities that are available to you with our HTML report generators. The possibilities here are endless and only limited by your HTML and CSS skills; we're just barely scratching the surface. The template engine we'll use for our HTML report is called ERB. A simple for loop: we're outputting the Issue's Title and also preparing the href anchors that we'll use to link to the full note in the Detailed Findings. First, we enclose each note's data in a <div> with note-content CSS class and an id of issue_<%= issue.id %>. This id is the one we used as href up in the list of issues. We then output the Issue's title within <h2> tags and then we add each of the relevant fields. That's it for body of the report. However, we want to add some bells and whistles to make it look nicer. We're going to use the excellent Highcharts library, in particular the column chart (make sure you check their licensing page as it is only free for non-commercial use). Replacing real data in the chart, will require a bit of work. We receive our issues in the notes array. Whilst all of them do have a CVSSv2 score, these are unsorted. Se need to go through the array and sort it based on the score. 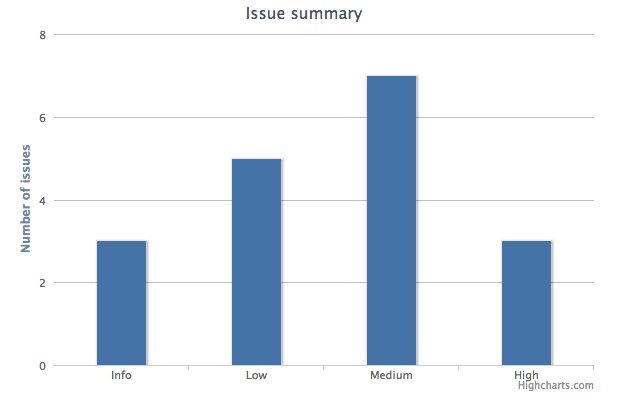 Where we are just counting the number of issues in each category. First we locate each CVSSv2 field. We'll use .cvssv2 class name assigned to the field. For each CVSSv2 field, we locate the corresponding issue container (with note-content class) and extract the issue id. Finally, we add a new CSS class given by the mapping in the noteClassName hash (see below). We're going to re-use the case statement we used for the chart for saving the mapping between each issue's CVSSv2 score and the corresponding CSS class. We define the global noteClassName hash that will contain note ids as keys and the CSS class as value. The white lines correspond to the ERB tags that evaluated Ruby code but did not generate any output. Generate the sorted hash in Ruby. Match against a regular expression for URLs. Replace plaint-text URL with an HTML link. That's it for now. We just need to copy the template across and use it. Follow the instructions on the Report Templates page of the Administration guide. If you run into any problems exporting your project through the Export Manager or your export takes too long, try exporting through the command line instead. Before you begin, locate the ID of the project you want to export and the location of your HTML report template. You can get your project ID from the browser location bar once you open the project in the main Dradis interface. For example, if the browser shows https://192.168.56.102/pro/projects/50, your project ID is 50. However, to make the examples more readable we'll use /tmp/test.html.erb as the sample location of our template in the following steps. Download your report from the output location (/tmp/) displayed after the export finishes.